Hope For A Greater Good - Dr. Matt Hersh - Awareness. Compassion. Empowerment. It’s so easy these days to be down on the world. There is so much misery and suffering, so much war and violence, so much self-righteousness, so much self-hatred. And yet, every single day there are millions of people across our planet making enormous strides for a higher and positive purpose. You may even forget this about yourself. You may be one of those people – using your talents, your hard-earned skills, your profound ability to heal the hearts and minds of those in need. If you are serving anyone in any way, you are adding to the greater good of this planet. But you may not feel the immediate impact of the good you are doing. And this can be disappointing, disheartening, and even disillusioning. So how do we live in this world when we can so easily forget that there is hope, that the world has not so utterly forsaken us. I am reminded of Tolkien’s small statured, stout-of-heart character, Samwise Gamgee, the understated hobbit extraordinaire. This hobbit was moving against all odds, against the pounding footsteps of war and impending desolation of his world, against the insidious rejection by his best friend, and against his own doubts. What I am struck by, among many things, is Sam’s mindful remembering that behind the dark clouds there is still sun. It may not appear that way, by any realistic account or assessment. But the darkness can give way to light. There is always light surrounding the darkness. I am also astonished by Sam’s acceptance of their circumstance. “By all rights we shouldn’t even be here”, Sam says. 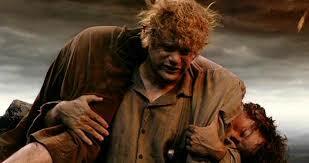 But he goes on to reassure himself and Frodo that this is the circumstance that must be faced. But faced with hope and recognition that all things change. That the darkness does fade. However, we must not mistake acceptance for resignation or liking our circumstances. By all accounts, Sam hated the life that had consumed him. But he understood that that was the life he was living, at that moment. All Sam had to decide (as Gandalf calmly beseeches Frodo in another part of the movie) was what to do with the time that was given him. So how will you make sense of your own circumstances? What will you do with the time given to you? Will you write off the world in which you live or bestow upon it, and yourself, a sense of hope? This hope can come not only from acknowledging that change is possible, but also from your ability to lift yourself up, walk across the floor, talk to someone you care about, jump up and down for more energy, breathe in and out through your belly to calm your mind and body, or eat an apple that crunches in your mouth so loudly it wakes up your daydreaming brain. CLICK HERE to subscribe to our mailing list for your FREE report and guide on happiness through acts of kindness. You will also receive many other other life-enhancing resources.